At Veterinary Village, our primary concern is for the health and well being of your cat. Unfortunately, there may arise a circumstance when a surgical procedure is in the best interest of your feline friend, and in these times you will need to make that decision. We understand what that feels like, and our veterinarians and staff are here for you too. Feline surgical procedures fall into two categories where your cat is concerned, elective procedures and those that are urgently necessary. Surgical attire. Staff must wear disposable caps when entering the surgical suite. Anyone involved in the procedure itself must also wear disposable mask, sterile gowns and single-use gloves. Sterile packs and equipment. Surgical instruments are carefully cleaned, sterilized, and wrapped prior to each procedure to help prevent infections and contamination between patients. While the decision to have your cat undergo surgery is completely in your hands, our veterinary team will present you with all the facts and possible outcomes to help you make an informed, ethical and compassionate decision that is in the best interest of both you and your loyal canine friend. At Veterinary Village, we adhere to very stringent guidelines for administering cat anesthesia before, during, and if necessary, after surgery. 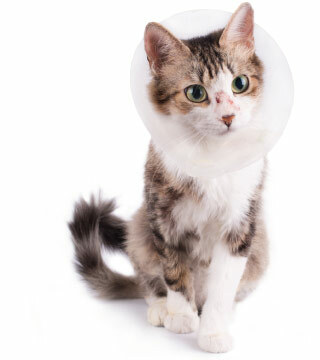 If you need to discuss surgical options, or schedule surgery for your cat, please contact us today. Our veterinary staff are highly experienced and caring cat people who are happy to help ease the stress and fear associated with cat surgery for you and your feline friend alike. Contact us to request a surgery for your cat!